Jim Lytle can’t help but get a little teary-eyed when he talks about his new business, Mediagraphix Photography, on North Jackson Street. Lytle for years served as chief photographer at Mississippi State University’s Office of Agricultural Communications. He also has shot for The Associated Press for more than 20 years.But Lytle’s dream has always been to open his own photo gallery and studio. These days, he’s living that dream. Mediagraphix Photography is one of a handful of businesses which opened recently in “The Studios on North Jackson,” located in the 1000 block of North Jackson Street. Lytle and Mediagraphix Photography occupy the southernmost end; the middle area contains Broadcast Media Group’s production offices, including three state-of-the-art high definition video-editing bays, an 850-square-foot studio and mass DVD duplication equipment, plus conference areas and office space. Coblentz moved his office to The Studios on North Jackson from his old building down the street. 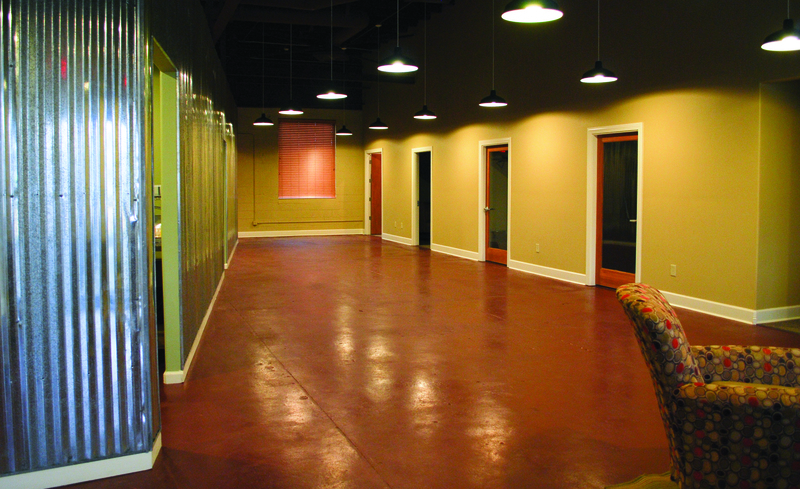 The northern space contains six individual offices Coblentz is renting to individual businesses. Three tenants rent the space so far, including a start-up company which offers high-quality work clothes. Jobman Workwear is a company which is based out of Sweden, but Charlie and Kathleen Griffin recently opened a U.S. office in The Studios on North Jackson. The clothing, which includes pants, jackets, long-johns and other items, is designed for the working man, Kathleen Griffin said. Griffin also commended Coblentz for the work he’s done to rehabilitate the building. The structure was built in the early 1950s and first served as a car dealership. It has since been a truck repair shop, a nightclub, a restaurant and a community counseling center. Coblentz estimated he put a “a couple hundred thousand” dollars worth of work into the building. Griffin and the other tenants appreciate the hours Coblentz and his wife, Bonnie, spent renovating the building this summer. “I think it’s a real asset, not only for Starkville, but for this area of North Jackson,” Griffin said. The north side of town is often seen as underdeveloped and neglected, Coblentz said. He lives in Plantation Homes, down the street from The Studios on North Jackson. He wanted to change what he called an “eyesore” into state-of-the-art workspace. Main Street Arts also plans to relocate from its downtown location to The Studios on North Jackson, owner Linda Wade said.